BOOM! This item was just so awesome that we couldn’t pass it up. I know by now the whole zombie thing is becoming super-saturated… I mean World War Z was a MAJOR disappointment. Walking Dead? It’s TOTALLY butchered the awesome comic that spawned it and with every episode it slips further and further away from redemption! Well, in my eyes it does. But DAMN, SON! 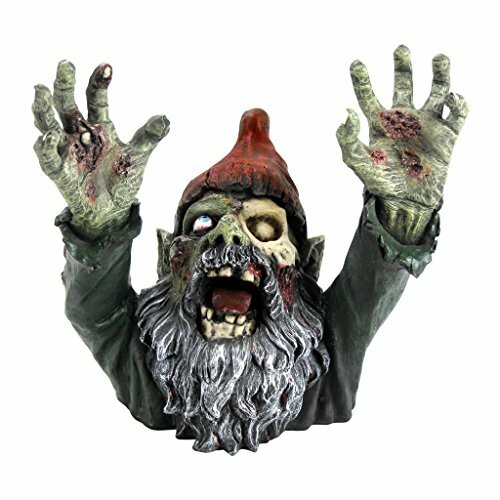 Who wouldn’t want to see this beautiful specimen of zombie gnome on their front lawn?! That’s right goths, zombie gnomes are here to stay! Check out the gruesome details on this sculpture. A whole third of his rotting gnome face is gone! All I gotta say is TAKE MY MONEY! And you should too. Live gothic today and give a few faceless zombie gnomes a new home and scare the living sugar out of your zombie-like mother-in-law. Trust me, it works! Almost a little too well at that… Click below to check it out!